Paul Allen, best known as the cofounder of Microsoft, has left his mark on numerous fields, from aviation and science to rock ‘n’ roll, professional sports, and philanthropy. His passions and curiosity have transformed the way we live. In 2007 and again in 2008, Time named him one of the hundred most influential people in the world. It all started on a snowy day in December 1974, when he was twenty-one years old. After buying the new issue of Popular Electronics in Harvard Square, Allen ran to show it to his best friend from Seattle, Bill Gates, then a Harvard undergrad. The magazine’s cover story featured the Altair 8800, the first true personal computer; Allen knew that he and Gates had the skills to code a programming language for it. When Gates agreed to collaborate on BASIC for the Altair, one of the most influential partnerships in the digital era was up and running. While much has been written about Microsoft’s early years, Allen has never before told the story from his point of view. Nor has he previously talked about the details of his complex relationship with Gates or his behind-closed-doors perspective on how a struggling start-up became the most powerful technology company in the world. Idea Man is the candid and long-awaited memoir of an intensely private person, a tale of triumphant highs and terrifying lows. To me, that’s the most exciting question imaginable….From technology to science to music to art, I’m inspired by those who’ve blurred the boundaries, who’ve looked at the possibilities, and said, “What if…?” In my own work, I’ve tried to anticipate what’s coming over the horizon, to hasten its arrival, and to apply it to people’s lives in a meaningful way…The varied possibilities of the universe have dazzled me since I was a child, and they continue to drive my work, my investments, and my philanthropy. Idea Man is an astonishing true story of ideas made real. 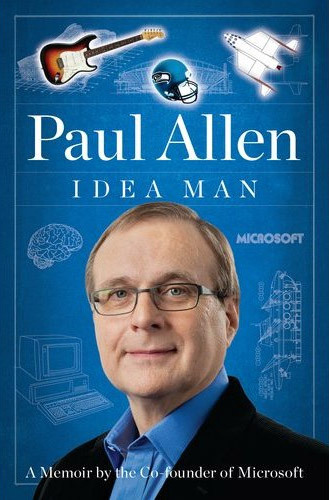 This entry was posted in Books and tagged biographies, creativity, paul allen. Bookmark the permalink.